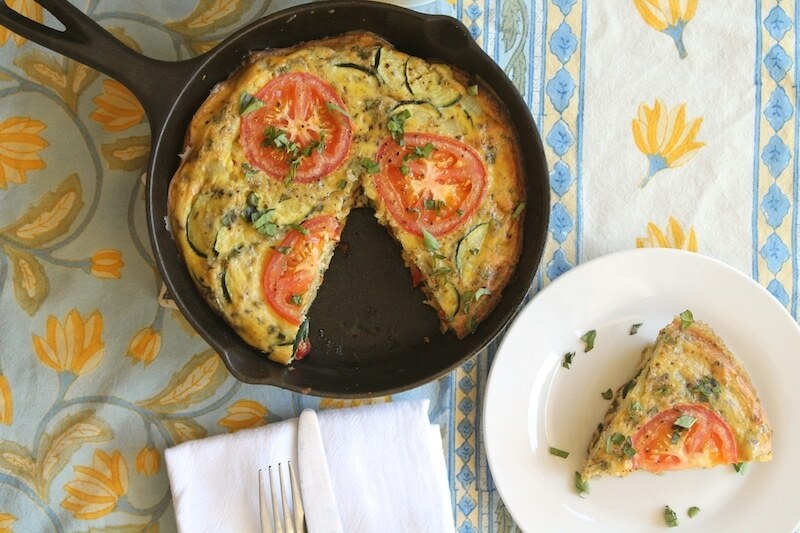 This summer vegetable frittata recipe is such a delicious, easy and healthy dish! One of the best things about summer (aside from the nice weather) is all the yummy produce that's in season. Lately I've been making use of a lot of zucchini, so this frittata is packed with it! 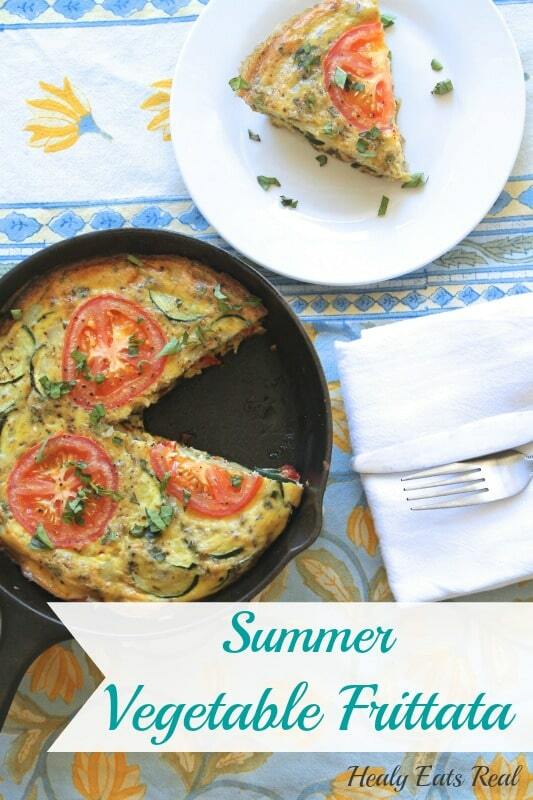 This summer vegetable frittata recipe is such a delicious, easy and healthy dish! One of the best things about summer (aside from the nice weather) is all the yummy produce that’s in season. 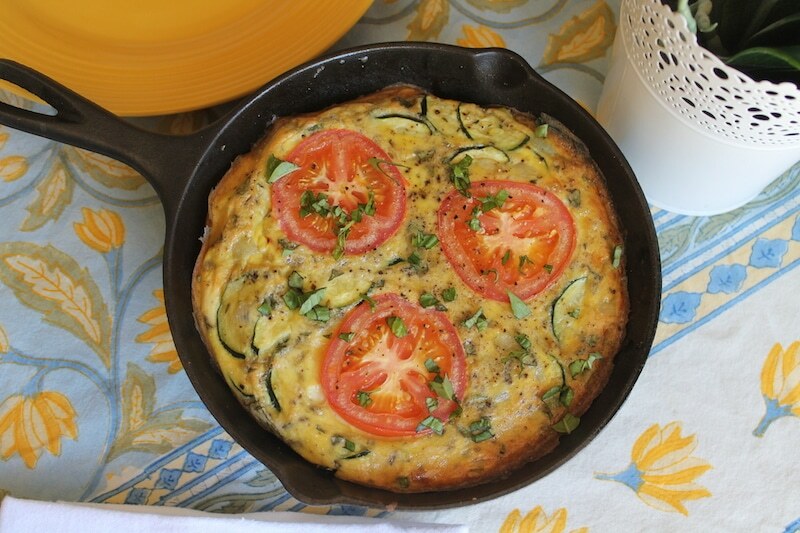 Lately I’ve been making use of a lot of zucchini, so this frittata is packed with it! I don’t use cheese in this recipe, so it’s paleo and dairy-free. 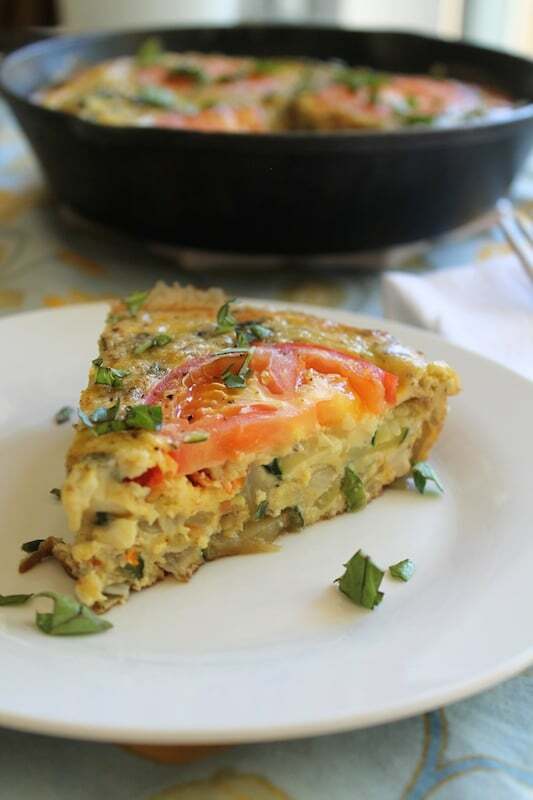 It’s a great recipe to make for a Sunday brunch, an easy weekday dinner or for any meal. It’s got protein, vegetables, it’s easy to make and it even looks pretty. What have you got to lose? Pre-heat the oven to 350°. Finely chop the onions and garlic. Wash the zucchini and slice in half lengthwise then chop into small slices widthwise. Place your 6.5 inch cast iron pan on the stove under medium heat and melt the ghee. Once the ghee is hot, put the onions in the pan and stir for a minute. Then, add the garlic and stir. Crack the eggs, coconut milk, salt and pepper into a separate bowl and whisk until well beaten. Add the sundried tomatoes to the egg mixture and set aside. Add the herbs to the onion and garlic and continue to cook until the onions are slightly translucent. Then, add the zucchini and mix. 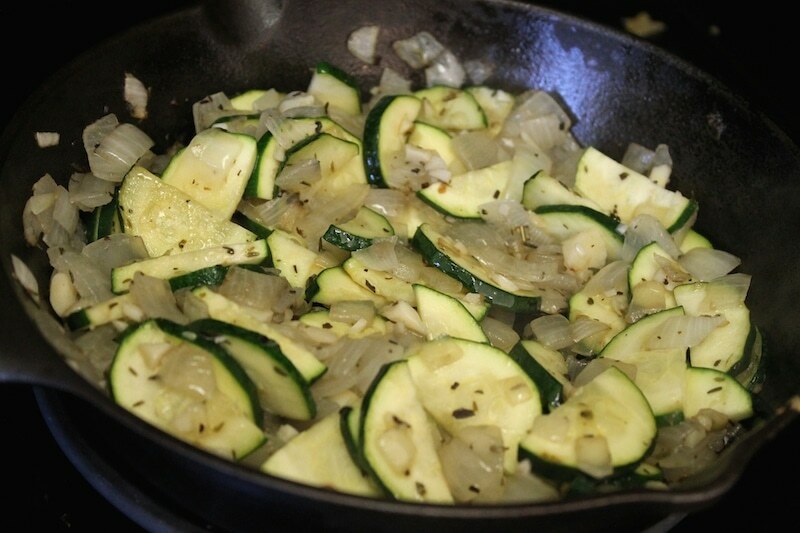 Allow to cook until the zucchini has softened. Slice the tomato into slices like you would put on a sandwich and set aside. 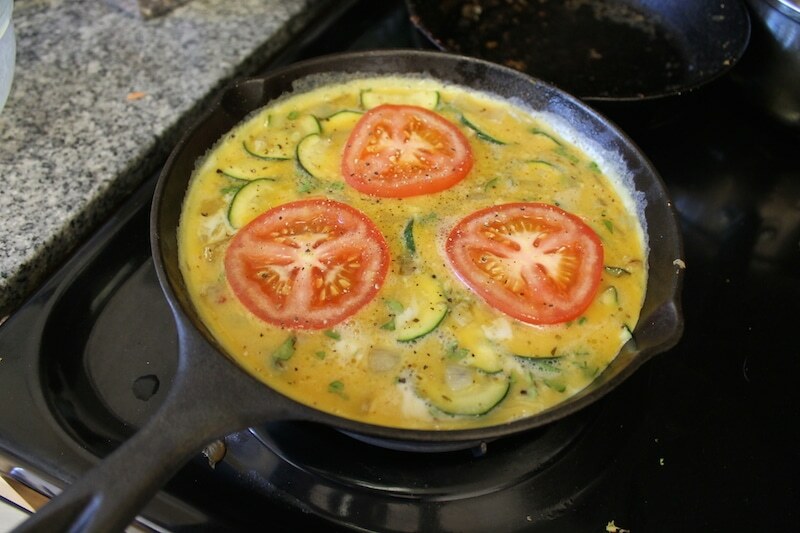 Once the zucchini has softened, turn off the heat then add the egg mixture to the pan and gently mix so all of the ingredients are evenly distributed. Place the tomato slices on the top and use an oven mit to transfer the pan to the oven. 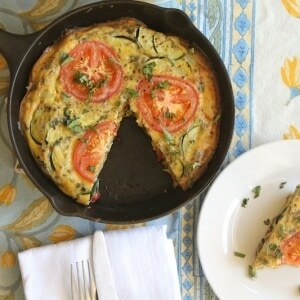 Allow the frittata to bake at 350° for 20-25 minutes. Once you remove it from the oven allow it to cool for a few minutes then sprinkle with fresh basil and serve!